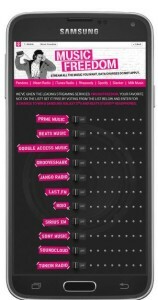 Yesterday (June 18th) T-Mobile announced Uncarrier 6.0 and as part of that Music Freedom. Essentially Music Freedom will allow T-Mobile customers to stream audio from supported providers without it counting against their high speed data cap and will allow them to stream music at high speeds when over the data cap. Currently Pandora, iHeartRadio, iTunes Radio, Rhapsody, Spotify, Slacker, and Milk Music are the only supported services but Legere says that they will work to include others. In this case T-Mobile is giving preferential treatment to audio streaming services over video, other data use and potentially other audio services. This acts as a violation of network neutrality and provides opportunity for unintended consequences. This is all a clear violation unless you are a fan of the Google/Verizon 2010 deal which redefined network neutrality (for them) to allow for discrimination between different types of data but not within a data category. Most comments and articles at the time were not fans of that plan for the internet. Now John Legere has announced a plan which is a perfect example of the Verizon/Google deal. Earlier this month AT&T announced a similar plan called “Sponsored Data“. The difference from the AT&T plan is that services have to pay for their position on the sponsored data plan so that their services data does not count against users data caps. From what I saw most comments were critical of that plan but my experience so far is that many users are ecstatic about the T-Mobile plan. Let’s get back to that opportunity for unintended consequences. There are several openings in this case. Currently there are a limited number of services that are covered in this plan. While John Legere says they will work to get other services on this plan, will it really happen? For the services not on the plan will it encourage T-Mobile users to use services on this plan? I found myself planning to use Pandora while mobile as opposed to Amazon Prime Streaming or Google Play while out due to this deal. iHeart Radio is included in this deal which streams music and talk radio. Will podcasters and other internet talk radio stations have a chance to join in this for free? I could see that giving a big advantage for the current big content producers. Most of these are what if situations so I am taking my own concerns with a wait and see approach. This is about when I get to the cheers. Violating Net Neutrality doesn’t always result in a negative result for the customer. In this case it appears to be a positive result for customers and is getting a large amount of positive fanfare. So in this case I believe this violation of network neutrality will be accompanied by cheers of T-Mobile customers and by envy of AT&T/Verizon customers. In fact I think AT&T and Verizon will take note of this to better plan how they will roll out similar initiatives in the future.